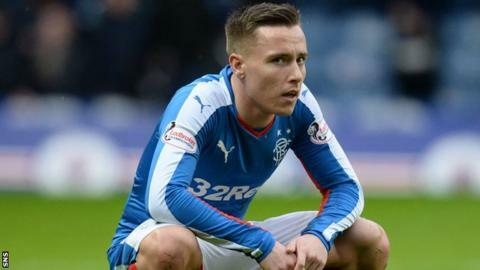 Rangers winger Barrie McKay has extended his contract with the Scottish Championship club until May 2018. McKay, 21, has been an ever present this season, scoring six times in 33 appearances. "It means a lot and it shows everyone how far I've come in the past year to earn myself a new deal," said McKay. "I was there when the journey back started and hopefully now we are going to finish it, and seeing it through will be a great personal achievement." McKay was this week tipped for a Scotland call up by Rangers manager Mark Warburton, with international boss Gordon Strachan set to name two separate squads for the friendlies with Denmark and Czech Republic next month. He has been capped at under-18 through to under-21 level. He told the Rangers website: "I made my debut when I was 17 and the change in me from then to now has been massive, and I feel the manager and Davie (Weir) have given me a lot of confidence this season."